Italy is so inviting. 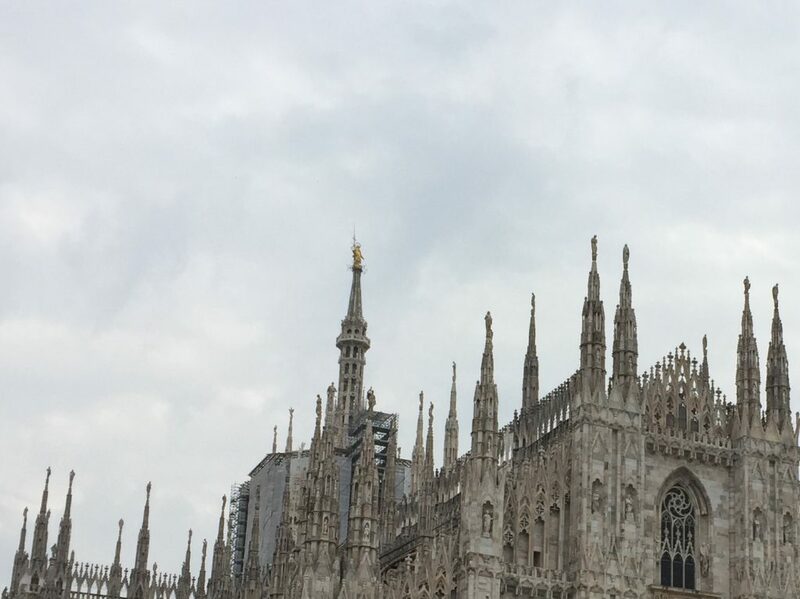 Alive and in love with beauty and truth, Milan has been so devoted to those—love, beauty, and truth for all of its history, even before people who lived hear began recording it regularly in written form about 600 years before Christ. They almost certainly did not think of themselves as Italian at that time as what is now Italy were then small city-states run mostly by ancient families including the Milanesi, Napolitani, Fiorentini, Lombardi, and Palermo, each controlling what are now Italy’s great cities: Milan, Naples, Florence, …. They were autonomous and at times competitive through the centuries, building beautiful churches, monuments, wells, gardens, sculpture as well as fashion, painting, poetry, and food. These were all created to emphasize beauty and the ways beauty is one with truth and love. So what is so inviting is that here in Milan, now, beauty, truth, and love are what you feel walking everywhere. They are pervasive, these—let’s call them values—primary influences…are ubiquitous. 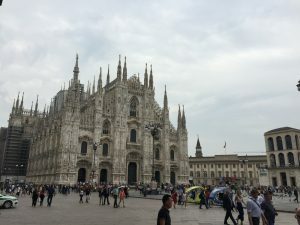 Here’s one example: the duomo, the main cathedral in Milan stands proudly in Piazza del Duomo. The Gothic-style cathedral has more statues (3,400) than any other building in the world. 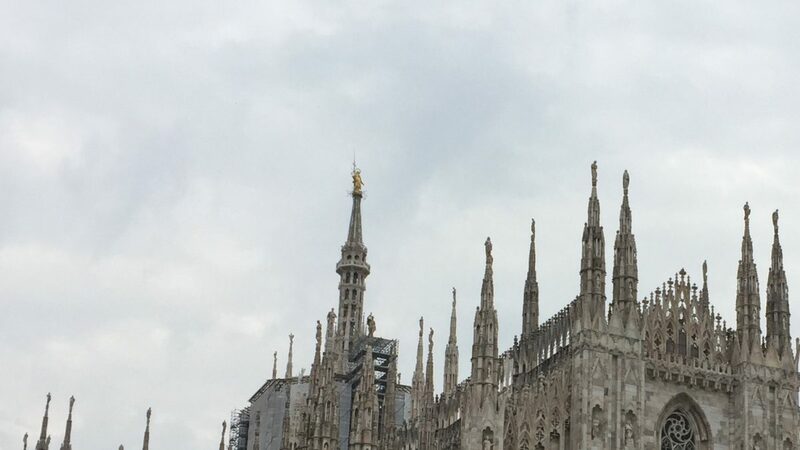 It also has 135 gargoyles, and 700 figures, the tallest of which is the famous Madonnina, the gold statue of Mary that stands on the cathedral’s tallest spire. The cathedral took six centuries to complete, starting in 1386. We go up to the top of the duomo on Tuesday to see it and the Alps in the distance. Even in what is considered Italy’s fastest-paced city, there’s a strong sense of patience, that time, unlike how we experience it in the U.S., is endless. This translates into the way people talk with each other and invite you into conversation. There is time for everything, for listening, for walking through the piazza where Milan was founded, where there is a well, nick-named the well of shame, upon which people were said to have to sit bare-arsed when they’d done something shameful so others could come by and kid them for their shameful deeds. Surely, no one from Athens State has ever or will ever upon this well!